Design and build electrical systems that are the brains of many modern engineering machines with a degree in Electrical Engineering! Electrical engineering is the largest engineering discipline in the world serving nearly every modern industry. The demand for electrical engineers continues to grow. 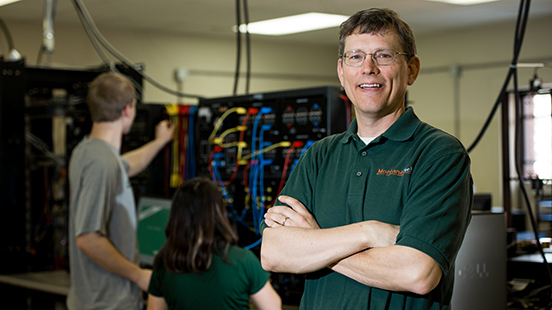 Montana Tech offers the Bachelor of Science and Master of Science degrees in Electrical Engineering. Our goal is to prepare graduates for immediately successful engineering careers. Our 84 undergraduate and 6 graduate students enjoy a close relationship with the teaching faculty. For more information, about Montana Tech's academic programs, view the Montana Tech Catalog. Click on Degree Planner to download the current curriculum worksheet. The Career Services Office at Montana Tech surveys all graduates each year. The purpose of the survey is to provide employment information and facilitate the career decisions for prospective and current students, in accordance with Sections 485 and 486 of the Title IV Higher Education Reauthorization Amendments of 1986. The Graduate Survey is published annually. Learn more about our bachelor's program. Learn more about our graduate studies programs. The mission of the Electrical Engineering program at Montana Tech is to provide a quality education that stresses the fundamentals of engineering, mathematics, and science in order to prepare graduates to enter and continue the practice of electrical engineering at the professional level. At Montana Tech, all of our Electrical Engineering professors are registered professional engineers in the state of Montana. Additionally, each faculty member holds a Ph.D., has significant industrial design experience, and works on research projects that employ students! ◾have developed new engineering solutions resulting in novel designs, publications, and patents. The bachelor of science in Electrical Engineering is accredited by the Engineering Accreditation Commission (EAC) of ABET, http://www.abet.org. In CSCI 255 this semester each student participated in a group to complete a final project. The projects ranged from building and programming a line following robot, to creating DTMF tones similar to that of a telephone. This playlist is a compilation of all of the students’ projects. The purpose of the projects were to create a report, video and code so that their project could be easily reproduced by someone who is familiar with the microcontroller. Good Job Students! Dan Trudnowski, the head of the Electrical Engineering department here at Montana Tech, played a key role in the development of a breakthrough for the electrical power grid. Read the full article here.